Welcome to Curtiss Tate's Tire and Service, your one-stop-shop for all your automotive needs on Grand Lake. Whether you are looking for tires for your car, truck, SUV, RV, ATV, tractor, lawnmower or a quick oil change we are here to help. We offer detailing by appointment only, give us a call today to find out more information. 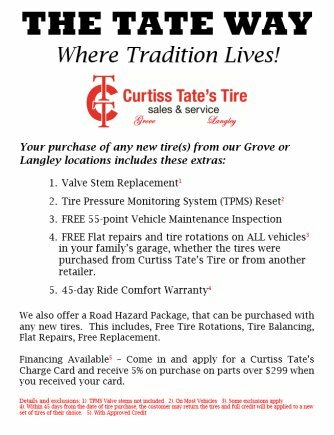 Curtiss Tate's Tire and Service takes pride in knowing that we have been family owned and operated since March of 1995. Our #1 goal is to go above and beyond to provide our customers with unbeatable experiences. At Curtiss Tate's Tire and Service we carry all major brands such as Contintental, Bridgestone, Firestone, Cooper, Michelin, Goodyear, as well as other major brands. Search through our online catalogs or use our tire fitment guide to find the perfect tire for your vehicle. Is your vehicle in need of repairs? Our ASE certified technicians are here to help you! They specialize in alignments, brakes, shocks and struts, transmission and radiator service as well as TPMS and much more. Do you have a ATV that is in need of repair? We have we a ATV Mechanic on duty at all times for all side by side, 4 Wheeler and etc. Whether you are on Grand Lake or from Grove, Jay, Vinita, or Miami, we are here to help you get your vehicle back on the road. Contact us today at (918) 786-9174 or schedule your service online. We look forward to serving you and your family for generations to come.